Charleston Fishing Adventures is Isle of Palms, SC and Charleston, SC’s Premiere Fishing Charter! The South Carolina Lowcountry Boasts some of the finest Inshore Fishing in the United States! With a remarkable year round fishery, there is always something to bend a rod. We are a Fully Licensed, Insured, and Established Charter Fishing Company! Located about 15 minutes away from Downtown Charleston, SC, we can have you on the water in no time! Our Charleston Fishing Trips are run on a top of the line Maverick 18 HPX, which is registered and approved by the South Carolina Department of Natural Resources and U.S. Coast Guard. It is fully loaded with all of the approved and necessary safety equipment. We also provide all of the tackle, bait, and licenses for our day of fishing! All you have to do is step on and have a great time! 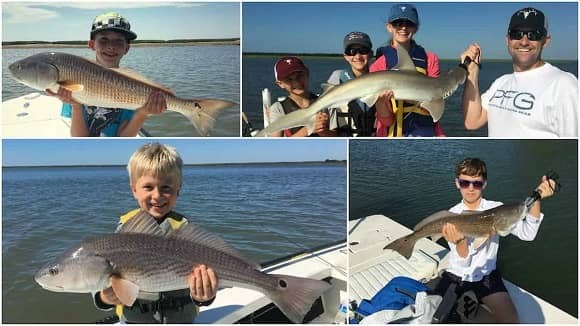 There are few better to ways to create memories for Families, Corporations, or first time Anglers than time on the water with Charleston Fishing Adventures! – 8 Hour Inshore Trip $800.00 for up to 2 anglers then $75 each additional angler. All Pricing includes gear (rods/tackle/etc. ), fishing license(s), water, bait and ice. Tipping is customary and greatly appreciated. Please see our Cancellation Policy below. I am Captain Garrett Lacy owner and operator of Charleston Fishing Adventures. From birth I was either in the woods or on the water! Throughout High School I led and promoted a group of fisherman and outdoorsmen that enjoyed our environment and gave back to the community. I lead several projects such as fishing sampling and fishing clinics with disabled children. At that point, I knew this was what I was meant to do. Shortly after, I founded Charleston Fishing Adventures. While a hobby quickly turned into a job, nothing makes me happier than introducing people and making memories doing one of the things I love the most. I am a member of the Coastal Conservation Association and a participant in South Carolina Department of Natural Resources Fish Tagging Program. Throughout my schooling I also competed, led, and organized numerous Fishing Tournaments. Starting with fishing the Southern Kingfish Association’s Tournaments, I then began to compete in The Lowcountry Redfish Cup and now Southern Redfish Cup Circuits. I still strive to compete in them today, that is if I don’t have a client on board. I have also been featured in several editions of the South Carolina Sportsman. I am dedicated Fishing Guide, and I spend most of my free time on the water trying to continuously improve my knowledge of fishing and its changing patterns. I am First Aid and CPR Certified and run the finest and safest boats available. With all of that being said, my primary goal is to provide my clients with a safe and memorable experience on the water. If fishing has taught me anything it’s been humility and professionalism, both of which never leave our boat. The Truth is I love what I do, and I could only hope to share it with every one of you. The primary way to maintain a sustainable fishery is through education and appreciation, and that starts in the beginning. Children are the front runners of Conservation! With that being said, there is no better to place to create memories than on the water! That’s why Charleston Fishing Adventures is Isle of Palms #1 Family Fishing Charter Company! Being on the water creates a bond and memories that will not soon be forgotten. Captain Garrett Lacy always welcomes and enjoys having children aboard. Captain Garrett also understands and is motivated by what it takes to keep a child focused while having a great time! That is a surefire when you book with Charleston Fishing Adventures. When the kids are having fun, the entire family is! When the Family is fishing, its not just about the number of fish you catch but also the bond and memories that are created with those you care about on the water. Book a Fishing Charter Now! Charleston Fishing Adventures takes cash, credit cards, and checks. All checks can be made payable to Fishing Charleston LLC. Simply the best! Hands down best fishing trip ever!The most knowledgeable and profession captain. We caught so many fish and made so many memories! Great for all ages! EXCELLENT! Garrett was awesome!!! Very knowledgeable and could drive his boat like a race car driver!!! The ride was the best part. Awesome day!!! I had an excellent time with Captain Garrett. We will be back! Had a great time and caught a lot of fish. My wife went for a grand slam reds,black drum, speckled Sea trout and flounder. Garrett knew were to go for the fish. Had a GREAT time.... one of those "perfect days" that don't come along enough in our busy lives.... Captain Lacy was great... caught the most and biggest fish ever!! Highly recommend!!! Had a wonderful time yesterday on our fishing excursion. Caught lots of fish. Highly recommend Captain Garrett. Outstanding guide service. He knew where the fish were and what we needed to do to catch them. It was obvious he spends everyday on the water. I think the fish know him by name. We loved fishing with Captain Garrett! Trip was for my husband and he had a great time. My son is 2.5 years old and he had a blast as well, he liked "going fast" and playing with the live bait. We caught quite a few fish, you can tell Captain Garrett knows what he is doing! Fishing is one of those on and off propositions. Sometimes the fish are on and sometimes they aren't. We had the rare day that they were not interested in cooperating but having Captain Garrett made the difference in a strikeout and a productive day. We did end up with 2 red fish to big to keep and 3 filleted and in the cooler. Garrett made the day fun with a great wit and hard work. We changed baits, locations and techniques. It still wasn't easy but my sons and I had a great time and can't wait to go again! Called and set up 4 hr inshore trip to match rising tide schedule. Due to cold water we got off to a slow start. Chuck worked to find warmer water and put us on a hole with redfish and black drum. We fished near another boat that came up bare. Chuck knows the water, tides,and bait. His 26ft boat is in Bristol condition. Great guy and a good day on the water. Highly recommended. Chartered Capt Garret this past year. We had a great time and we caught several Reds and Sea Trout. He was a very personable Capt. I highly recommend him! I booked two days with Garret. First fishing day Garret put me on schools of red fish in the shallows being pressed by dolphins. We were able to move around and catch fish. Second day was awesome. He was well tuned to the areas to fish and at what times based on tidal changes. We caught 20 fish several ten pounders several six to eight pounders and Garret tagged 13 of the fish for the fishery sustainability. His knowledge of the area was impressive. He was generous with his time and interested in passing on his knowledge of fishing of the Charleston inlercoastal waterways. My husband and I were thoroughly impressed with Captain Garret's knowledge of fishing!! He knew where to fish according to the tides and which bait to use (cut or live) according to which fish you prefer to catch. He knows the inlets well and is very accommodating. He is a true Southern Gentleman!! We will definitely return for future trips. This was money and time well spent for a great day. Just got off the water with Captain Garrett and couldn't be happier with the morning fishing excursion! Aside from being a personable and knowledgable guide, he was able to put us on the Reds right out of the gate! Low tide, high tide, no tide, Garrett will find the fish! We had a great morning of low country fishing with Captain Garrett for a great Father's Day Celebration. We met up at the Marina and headed out for a relaxing morning catching Trout, Drum & Flounder. Everyone caught something and it was a tremendously relaxing morning. Garrett was fun and knowledgeable and had bait at the ready whenever we needed to "reload!" The three of us had a great morning and Garrett made it effortless and fun! I have booked a lot of charters, both inshore and off. I have never had more fun than I did with Captain Garrett Lacy. Garrett is an up-and-comer. He is a young captain, but has more local knowledge, energy and enthusiasm than any other captain that I have fished with. Captain Lacy kept us on the fish all day! Look no further for another charter, you won't be disappointed! I can't wait to book my next one with him. My 11 year old son and I went out with Captain Garrett Lacey for a half day of inshore fishing. Garrett is a great guide. He put us right on the fish and was great with my son. We caught a whole bunch of trout, blue fish and a 4ft bonnethead shark. We will be back to fish with Garrett again. Captain Garrett Lacy is awesome! We had a wonderful fishing trip on my husband’s birthday! I had no intention of fishing, I was just along for the ride, but Cpt. Garrett said, “You are catching a fish today!” And he made sure I did! Twice!! Great day! Tons of fun! Thanks!